TJ Harris is 34 years and is a Firefighter with the City of Tulsa since 2011. TJ has seen results in body composition. He is mentally stronger to take on tasks that may not be that comfortable, but he is able to stay focused to complete and “be his best”. He is also applying that to his home life. He says, “I’m a better man because of the support system and values that FFR instills in us. He is excited about the changes he has seen from FFR. He has learned how to cook and prep compliant meals and is getting his family on board with the healthy fit lifestyle. FFR has and is making a huge change in TJ’s work life. 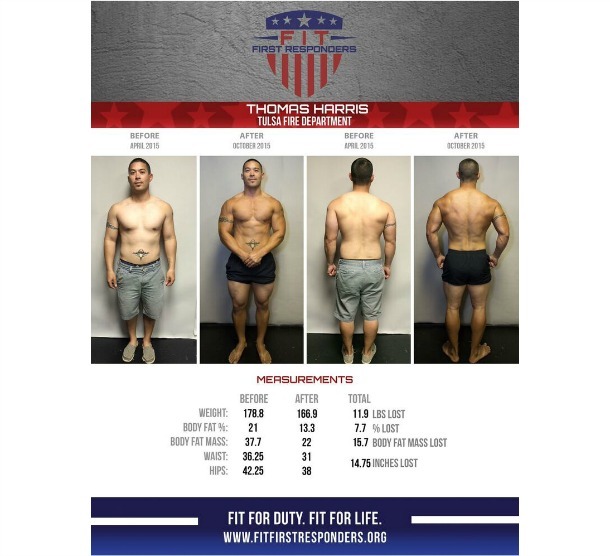 The biggest change is seeing guys interested in finding out what TJ has been doing and how they can start FFR classes. Now that the 25 week challenge is completed, TJ plans to continue to work out with FFR. TJ says his goal is to get bigger and stronger and faster, always trying to push his fellow FFR’s to be the best that they can be!